Bridgewater, NJ- HomePlate Catering and Hospitality, the food and beverage provider for the Somerset Patriots, is currently looking for volunteers from non-profit Organizations looking to raise funds for their group by working the concession stands at TD Bank Ballpark during home games this season. By working the concession stands, non-profits will receive a portion of the total sales from those stands for the games they work. Participating groups will have the opportunity to volunteer within the two main concession stands or at specific portable locations around the concourse. Tasks include preparing and selling food and beverage products to fans attending Somerset Patriots games. Any group that is interested in the program will have no cost to them to begin fundraising with HomePlate Catering and Hospitality. All volunteers must be 16 years of age or older and should expect to be at the ballpark for about five hours. 2019 will be the third year for the program offered by HomePlate. To date, HomePlate has worked with local churches, high school bands, college athletic programs, and other social groups. The groups have volunteered for a variety of tasks in the concessions areas. 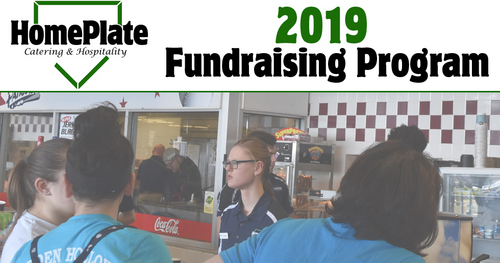 For more information about fundraising with HomePlate, please contact Jimmy Search at [email protected] or CLICK HERE FOR MORE INFORMATION!